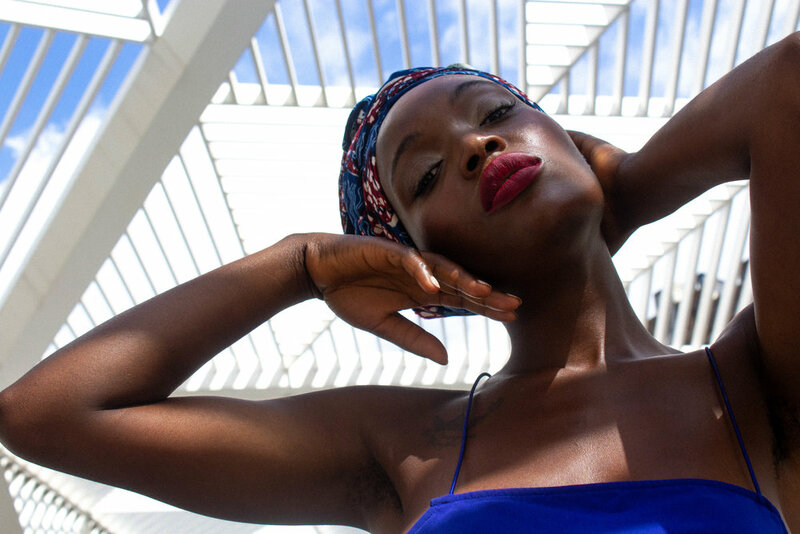 Folasade Adeoso Talks Modeling, Art, Running a Business, And How She Handles It All — EveryStylishGirl. My name is Folasade Adeoso, I was born in Nigeria, moved to Toronto when I was about two years old with my mom to meet my dad who was already living there. Then we moved to New York my senior year of high school, and then, I guess that’s when my life started happening. Thank goodness for NYC. I think I was about 19 years old when I started. I met a few guys from Brooklyn, and we just became this little crew hanging around. I had one friend who would always walk around with a camera but I would never let him take a photo of me. I was very insecure. I didn’t know how I would translate in a photograph, but he convinced me. I put on this big afro wig and we walked around Flatbush. He took candid photos of me in this neighborhood and just really captured me in my natural element. It started from there, so after that, people started seeing the photos, and I met other photographers. I made connections, and started to put my own team and shoots together because I was having trouble finding and getting booked by agencies. So using my connections and friendships, we just all came together and started curating our own shoots, like back in the tumblr days. From there it grew, and my photos and shoots just kept getting reposted. Now I just keep pursuing it on my own, so more freelance and collaborating with others. ARE YOU STILL FREELANCE NOW? Still freelance now, but thinking about trying agencies again. I’m a little bit more confident now, and if they don’t want me I know I can do this on my own. And I also want to find the right agency where I can still be in creative control of my own life. I could never give up shooting with my friends or collaborating with others. WHAT MADE YOU START YOUR JOURNEY AS A FASHION AND BEAUTY INFLUENCER? From the photos, people started to ask me questions and advice. I also had a blog, Love Fola. I’m trying to bring it back more and do more journal entries opposed to just style and beauty. It was originally a journal, and then when the influencer thing started, it became more centered around beauty products and style. I feel like I lost some readers because before, I would write more personal things that were happening to me at the moment, so I want to relaunch it still as an influencer but in a journal style... less focus on products, and more authentic to me and how I feel. YOU’RE NOT ONLY A MODEL AND INFLUENCER, YOU ALSO CODE AND DO DIGITAL DESIGN. WHEN DID YOU DISCOVER YOUR PASSION FOR THEM AND HOW DID YOU GO ABOUT PURSUING BOTH? When I was in my freshman year of high school, I took a graphic web design class and that’s where it started. My family always had a computer at home, and I was good at using it and always interested in it, so when I saw that elective I knew I was definitely taking it. So yeah, I learned my freshman year of high school, and then I just started coding on my own, starting with my MySpace page. I would do all these things like flip my profile and people would always wonder how I did it, so I figured I must be getting good at it. From there I started making collages... and I never really considered myself an artist; being Nigerian it was always assumed I was going to be a doctor or something similar, but I’m an artist, and I discovered that through my high school web design class. YES! SO SPEAKING OF YOUR ART, CAN YOU TELL OUR READERS A LITTLE BIT ABOUT IT? Honestly, I’m still trying to figure out how to talk about it. I make these collages on photoshop, so it’s not cut outs. I find old scans, and do a lot of research, and saving photos. I use a lot of flowers, and birds, and my work is often centered around woman, majority of the time black women. I often search up photos of like Zoe Kravitz, or Naomi Campbell, and then use their silhouettes as a base to start collaging. YOU’VE TOUCHED ON IT A BIT ALREADY, BUT FROM WHERE DO YOU DRAW MOST OF YOUR ARTISTIC INSPIRATION? It always just starts out as an idea. Sometimes it’s just an itch where I just feel like I need to make something. Other days I’m staring and searching on the Internet for hours until something comes up. I go off of a feeling, waking up and just feeling like today’s the day I’m going to create. I just feel it and it starts happening. For that reason, I’m not producing a lot of work consistently; some days I just don't have that feeling or I’m not inspired. It honestly could be six months before I make something, but once I get that feeling or that idea falls into place, I’m collaging. HAVE YOU ALWAYS EXPRESSED YOURSELF IN A DIGITAL MEDIUM? Always. I’ve tried mixed media… I don’t know how to paint or draw, and when I cut things with scissors it’s always jagged, so I really just stick to photoshop. SPEAKING OF YOUR DIGITAL ART AND CODING, CAN YOU TELL OUR READERS ABOUT F.A. DESIGN STUDIO? F.A. Design is a web design studio I started last year. It’s a one-woman show right now, but I’m hoping to expand it to a design agency. Right now, I design websites for female entrepreneurs, non-profits, and creatives. It started out very female-based, but then I had male friends asking for my assistance and of course I was going to do it ahaha. Also, I want my studio to work for a diverse group of people. I don’t want to pigeonhole myself and limit my personal and creative growth. WHAT LED YOU TO CREATE F.A. DESIGN STUDIO? Like I said, it mainly started out female-based. I was doing research on businesses and business owners, and I read that at one point, African-American women were the highest-growing businesses in America which shocked me, I was like, "If that’s true, where are they?" And one of the biggest things I realized from just friends and family and their businesses is that people need websites to communicate and get their business out there. So when I read that African-American women were the fastest-growing business, I thought about an auntie braiding hair in her living room, or a lady catering baby showers, but that’s all word of mouth. It’s important entrepreneurs get their business and voice out there, and I think the best way to do that is with a cohesive website. BETWEEN SO MANY TALENTS, MODELING, DESIGN, CODING, AND JUST BEING AN ALL AROUND ROLE MODEL, HOW DO YOU FIND YOURSELF BALANCING IT ALL? I take a lot of breaks. I just disconnect a lot. Sometimes it hurts me and my social media presence; if I’m not on for a week it can affect my numbers and followers, but I don’t really care, I need a break, especially since I’m always looking at a screen. So yeah, sometimes I just literally turn off my phone, and replace it with meaningful conversations. I’m also trying to read more… traveling also helps. Traveling and being with my family really helps me balance things. WHAT DO YOU FEEL MOST ACCOMPLISHED FOR IN YOUR LIFE RIGHT NOW? Honestly, being 30 and happy. I’ve gone through a lot of different phases in my life, and 30 has just been one of the best things that has happened to me. I have a little bit more wisdom, I have better relationships with people, my family, my boyfriend… It’s like all these things that I wanted when I was in my twenties is starting to happen and fall into place now, from my career to personal goals. So yeah, 30 has been a great accomplishment for me, and I mean I’m alive, so that’s something to be proud of. AS A WOMAN OF MANY TALENTS, IS THERE ANY ADVICE YOU CAN GIVE TO OUR READERS ON HOW TO PURSUE AND HANDLE SO MANY DIFFERENT PASSIONS? Yes, and I think this is still a piece of advice I need to listen to myself: Find help. Whether it be a friend or your sister... you can’t do everything by yourself, you’ll get drained quickly. Also do a lot of research. There’s free classes on how to start businesses all throughout NYC, as well as the Internet. Personally, I take those classes all the time; you’re amongst other people who don’t know you like your friends and family, and they often can provide new insight and feedback. So yeah, use free resources, and if you need help, build a team. Also, take moments and breaks to figure it out. If you lean towards one thing it’s ok to put other things aside to explore that passion. It’s all a part of you, so it’s ok to focus on one thing sometimes and then come back to another. I have many areas in my life where web design is the main focus, but a few months down the road, I’ll have these influencers gigs and that will consume my time. It’s all about finding a way to balance them and not feel guilty about exploring one over the other because they’re all a part of you and live within you. OUR NEXT PART ARE FIREBALL QUESTIONS, ANSWER THE FIRST THING THAT COMES TO MIND - WHAT’S THE BEST PART OF YOUR JOB? DESCRIBE YOUR STYLE IN TWO WORDS? FAVORITE LAST THING YOU’VE READ? Where'd You Go Bernadette, I finished it a few days ago and I'm still shook. App… I’m not really an app person but anything to do with photo editing. WHO’S SOMEONE THAT INSPIRES YOU? Kandace Banks On How She Went From Backyard Photo Shoots To Styling HBO's "Insecure"